Float fishing the Colorado River between Pumphouse and Radium is one of western Colorado’s most popular floats for good reason. The scenery is spectacular and the fishing incredible. Float fishing on Vail Valley Anglers section of the Upper Colorado River begins immediately below the Class 5 white water of Gore Canyon at the Pumphouse Recreation Area. The upper stretches of the Colorado River, as it descends from its source in Rocky Mountain National Park, offer some of the states finest float fishing for trout beginning at the Pumphouse Recreation Area. Pumphouse is located on Trough Road or Grand County 1, to get there from Kremmling, Colorado head south on Highway 9 for one mile, turn west onto Trough Road. Travel about ten miles down this dirt road and come to access point marked by a large BLM sign. To arrive at Pumphouse from Vail, Colorado at Wolcott, head north 12 miles on Highway 131 to State Bridge, turn onto Trough Road and head north 18 miles to Pumphouse access. This developed recreation area is maintained along the river by the Bureau of Land Management (BLM) Kremmling field office about twelve miles upstream. The BLM charges a nominal ($5 per day) parking or camping ($10 per day) vehicle fee for use of the developed recreation area. Several cement boat launches, toilets, parking lots, designated camping areas and picnic tables are found at the Pump House Recreation Area. Below Pumphouse, pulling the boat in for overnight camping is allowed and there are a few campsites with picnic tables along the river. Downstream of Pumphouse, is almost all BLM property along the river for about 4.2 miles to the next river access, Radium Recreation Area. River right is also almost all public water with exception of some small railroad parcels. Anglers can get out of the boat to wade fish wherever they want. The Pumphouse to Radium river stretch provides mostly class 2 water but “Needles Eye” Rapid is class 3 or even a risky 4 water when the river is high (above 3000 cfs). The upper stretch is a mild braided meadow section. The canyon features faster rapids and waves with large boulders and care should be taken while rowing this section. The end of the float is slower with more braids. Drift boats work well above 500 cfs and below 3000 cfs while rafts are ideal in low and high water. The Upper Colorado River has several large dams on its tributaries above the Pumphouse launch. These tributaries can have an effect on the river flow, clarity and temperature. The river floats best between 800 and 1200 cubic feet per second (cfs) but will fish well at only 400 to 600 cfs. The water can exceed 4,000 (cfs) some years for a few weeks and still fishes well, albeit rowing conditions at high water are dangerous. Pumphouse actually gets cold water releases for most of the summer season, so as our other reliable freestone rivers like the Eagle River and Roaring Fork tributaries begin to drop, the dams begin to release water. One of the secrets to the great dry fly fishing is this consistently cooler, clear water. When big rains muddy up the Colorado River below Sheephorn Creek which enters the river in Radium, often Pumphouse to Radium can be a fly fishing guides savior, still offering fishable water clarity when the remainder of floatable water downstream has turned to mud. The water temperatures begin to rise on the Upper Colorado in April as the spring Colorado sun strikes the low water. With the dams only releasing minimal flows typically until July, this section of river has very few days of muddy unfishable high water during the spring and early summer. Rafters do not get to the river, in force, until the end of June and at 60,000 plus visitors a year this section of river can be a bit crowded at times. When the water is 42 degrees or colder try midges, egg patterns and San Juan Worms, and for best results nymph, the slower pools. As the water warms you will get action on streamers cast to banks with a slow retrieve and long pause between strips. Black, brown, olive and peacock are all good colors to use for streamers. BWO’s are very important to the trout in the Colorado River as they are eager to see them arrive in the spring and the fall. These insects tend to hatch all year except for winter but are thickest in late March, early April and come on strong to finish the season in September and October. The Giant Pteronarcys stonefly hatch comes in late May to June, the naturals are the size of small birds, unfortunately the fish eat so many of the large black nymphs as they make their way out of the water and crawl to the bank to hatch the dry action can often be slow during this hatch. Caddis, PMD’s, and terrestrials all provide good surface action throughout the summer. Trico hatches begin here in late summer extend to early October. Fall brings on the best streamer fishing of the year as large browns go on prowl before spawning. Summer can see lots of boats, lots of guides, and lots of people. Sounds like not such a good spot for fly fishing opportunities, but with more than 2,000 trout per mile (mostly browns with fewer rainbow and even the occasional cutthroat or brookie) augmented by a healthy whitefish population, it is a surprisingly a wonderful fishery. Fish in this particular section of the Upper Colorado River are not overly shy boating traffic but are schooled in the ways of the fly fisherman. 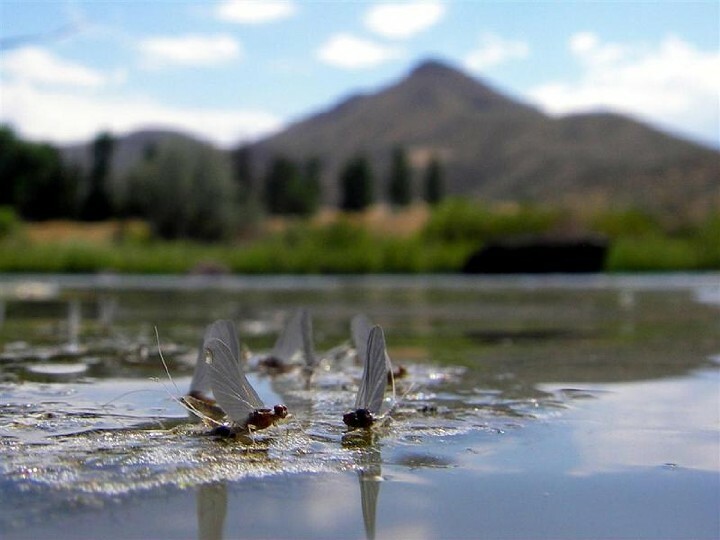 Most fly anglers will need to be using the right flies, at the right time, with the right method, to be successful float fishing the Upper Colorado. Keep in mind, during fall the fishing is great and the river can be void of people. 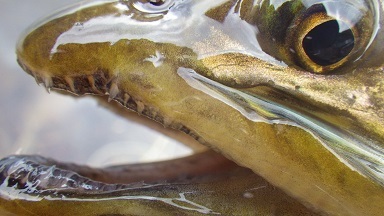 It generally fishes better for bigger trout with nymphs, but this stretch has revealed some monsters over the years on streamers. It will also surprise some anglers when hatches are slim but large trout come aggressively to the surface for terrestrials. Since the float is only 4.2 mile take your time, if you can wade, get out of the boat and let the rubber hatch of whitewater rafts go past. The raft hatch, moves past quickly on this river. The most boats are found in abundance from 9 am to 10 am and again after 1 pm for about an hour. Get out early or start late! This is the state of Colorado’s third most popular whitewater destination for a reason; it is really scenic, provides fast water and flows through a remote part of the state. Be patient, smile and wave because when the boats floating past move on, you will catch fish. While this section sees it share of traffic, it fishes even better now than it did decades ago. The trout population during that time has done a reversal, with rainbows giving way to brown trout, which make up 80% of the trout population. 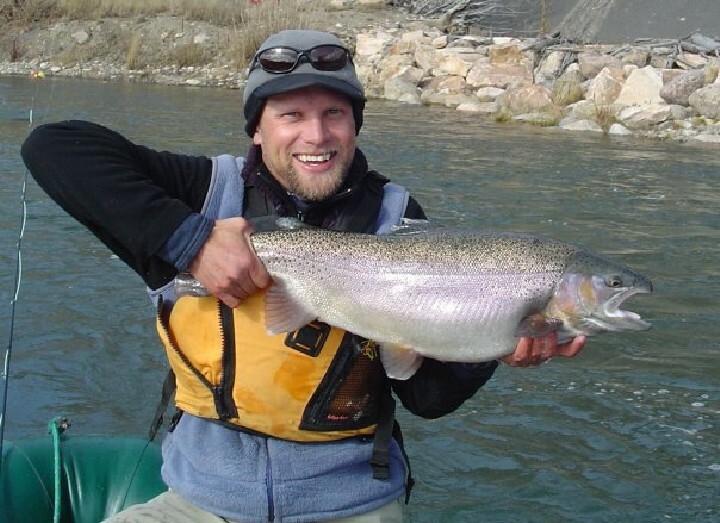 The Upper Colorado stretches from Kremmling to Dotsero for about 60 miles and maintains at least 1200 trout per mile but the Pumphouse to Radium section has a higher density of fish. Guided trips are great way to experience the fly fishing between Pumphouse and Radium. Book your trip with Vail Valley Anglers today! We will be writing a weekly blog series detailing all the float trips on the Upper and Lower Colorado River throughout the fall. 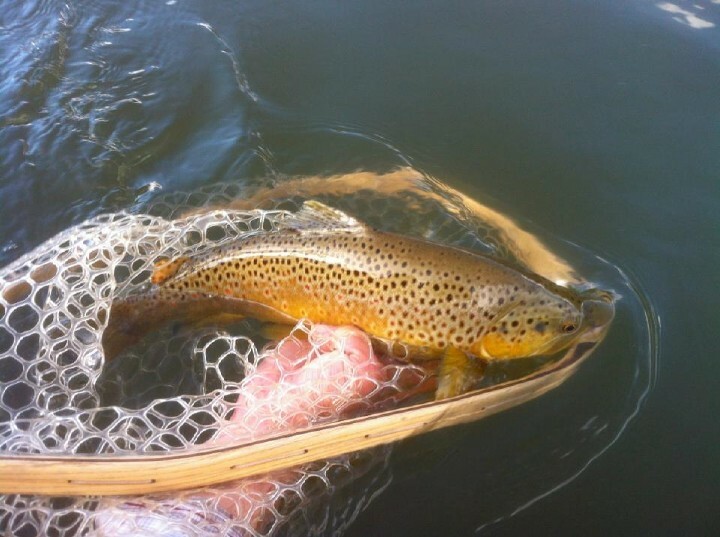 Check them out for some awesome fly fishing and floating information on our favorite river.